Save the date to join us in celebrating 100 years of unity. LOCATION: CUPE Local 50, #201 – 2736 Quadra Street, Victoria, B.C. This year is a milestone year as we celebrate the 100th Anniversary of receiving our Charter in 1918. We would like to personally invite you to our 100th Anniversary Open House get-together so that we can gather to reminisce, honour and recognize our current and retired members for paving the path that we follow today in serving our members and communities. This will be a great opportunity to meet old friends, share stories and memories, and recognize all of the hard work that has taken place over the past century. 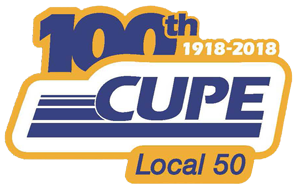 Please Note: This event is for Current Local 50 members, Retired Local 50 members and Invited Guests of CUPE Local 50.